December 8, 2018. New Delhi, India – This morning the sun shone in a hazy sky as His Holiness the Dalai Lama drove to Siri Fort, where he was to give the 1st Yuvraj Krishan Memorial Lecture. He was welcomed on arrival by Yuvraj Krishan’s daughter Giriraj Krishan Varma with her daughter. They escorted him into the auditorium where an audience of more than 350 invited guests awaited him. Krishan’s son, Shrikant Krishan welcomed His Holiness on behalf of his family and introduced the event. He explained that it was when His Holiness had first shown an interest in the family house, ‘The Brig’, and the estate on which it stood in McLeod Ganj, Dharamsala that his father first met him. Shrikant Krishan recalled his own first meeting with His Holiness in 2002 and being struck by what he had to say. On that occasion he had pointed out that when we’re angry we generally feel that it is the person we’re angry with who is harmed by it. However, His Holiness observed that if we think more carefully we might see that it’s we who lose because our anger destroys our peace of mind. His Holiness’s remark in his letter of condolence to the family when their father passed away that he had lived a meaningful life brought them great solace. Next to speak was Supreme Court Judge, Justice AK Sikri. He quoted a story in a book by a follower of His Holiness the French monk Matthieu Ricard that shows how many of us do not give sufficient value to what happiness is or to how it can be achieved. When an American photographer friend answered how she saw her future unfolding by saying she simply hoped to be happy, her friends were taken aback by her unaffected reply. Another friend told of listening to a Tibetan in Tibet recounting the distressing experiences he had undergone without anger or vengefulness, but with equanimity. Mr NN Vohra, until recently the Governor of Jammu and Kashmir, told the audience how happy and privileged he felt to be participating in the 1st Yuvraj Krishan Memorial Lecture with His Holiness. He recalled that Krishan had been a contemporary of his brother’s at the University of Lahore. When India gained its freedom he was invited to join the IAS but soon gave it up to go into the more peaceful realm of Accounts. He reported relying on Krishan’s willingly proffered advice early in his own career. Once His Holiness was settled in McLeod Ganj, Mr Vohra was deputed to serve him. His Holiness was learning English at the time and Vohra has an abiding memory of seeing him sitting in the sun avidly reading The Statesman. Later, when he was working in Home Affairs he consulted him about how to deal with difficulties associated with Rumtek Monastery. More recently, while he was in service in Jammu & Kashmir he would meet with His Holiness when he came to Ladakh. 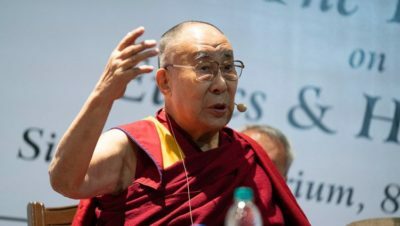 His Holiness opened his own address by telling his hosts and the audience that he would prefer to speak from where he was sitting, rather than from the podium, with their permission. “Brothers and sisters, I’m greatly honoured to have the opportunity of interacting with you here. My relationship with Yuvraj Krishan came about after I escaped to India due to the difficult circumstances in Tibet. After 1956 the Chinese communists began to carry out reforms in Tibet. It’s not that Tibet didn’t need to be reformed, but whatever changes were to be made had to be realistic and not imposed from outside. “The Chinese started to enforce reforms as they had in their own land where many landlords exploited their tenants. The situation was different in Tibet, a country that followed the Buddha’s advice such that even insects were protected. It was a compassionate society. “Imposition of reforms provoked revolt, first in Kham, next in Amdo, then across the whole of Tibet. I tried my best to cool things down, but eventually had no choice other than to escape. “On 10th March 1959 virtually the entire population of Lhasa came and surrounded the Norbulingka Palace to protect me and prevent my arrest. I tried to persuade them to disperse and wrote letters to the Chinese officer in charge. I also received a message asking me to identify in which rooms I was staying in order that they could be protected, although it wasn’t clear if this was the real intention or whether they wanted to know where to target. After 10th March there had been troop movements by night and on 16th March, artillery in front of the Potala that had previously been covered up was on open display. “When I left Lhasa on 17th March our intention was to reach southern Tibet and stop there to negotiate if possible. However, the bombardment of Lhasa that began on 19th March put an end to that idea. We were unsure whether the Government of India would give us asylum until we received a message of welcome. The day in April 1959 when I crossed the border a new life began. I met officials whose faces I recognised and I felt safe. It was one of the happiest moments of my life. His Holiness explained the longstanding relations that have existed between India and Tibet; how the Tibetan script was modelled on Devanagari, how Tibet turned to India to learn more about Buddhism and how the leading scholar of his time, Shantarakshita established the Nalanda Tradition in Tibet. He explained how originally Indians were the gurus and Tibetans were the students, but since the knowledge Tibetans have preserved has been neglected in the land of its origin, roles have been reversed. With the generous support of the Government of India and several state governments, Tibetans have become a relatively successful refugee community. His Holiness clarified that within ancient Indian knowledge are instructions for tackling destructive emotions using reason and logic. Because he feels this is relevant today, he is committed to encouraging a revival of this understanding. He is convinced that India is the one country that could combine such knowledge with modern education. He envisages other countries in Asia following India’s example. With regard to ethics and happiness, he said happiness doesn’t need much explanation. All sentient beings are looking for joy. In early life our survival depends on our mother’s care and affection. As we grow up we survive in dependence on the community. Modern education is oriented towards material goals, but to build on the basic compassionate nature of human beings, it needs to incorporate inner values. He loosely defined ethics as concerning actions that are intended to make others happy and do them good. Former TV anchor, Vikram Chandra moderated a question and answer session. His Holiness clarified that for changing the materialistic orientation of education and modern ways of life to be effective might take 20-30 years as new generations were trained from kindergarten to university. He said it will take vision, a clear idea of how to implement it and a greater role for warm-heartedness. He added that quantum physicists’ understanding that things do not exist as they appear and insight into the extensive role of mental projection will be helpful. He suggested that in addition to running sensationalist stories media people should also inform the public that peace of mind is achieved through mental training. He remarked that understanding that appearances do not reflect reality is helpful. If we emphasize secondary differences of nationality, faith or race, it only leads to division. And yet we are all the same in being human; mentally, physically and emotionally the same. Responding to a question about bringing up children His Holiness recommended asking them if they preferred to have friends or enemies. Then pointing out that smiling leads to trust and trust is the basis of friendship. 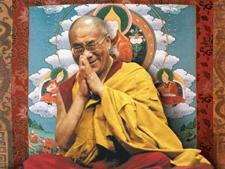 However it has to be a genuine smile, not like the artificial smiles he learned to show in occupied Tibet. His Holiness was asked how people facing grief or ill-health can find happiness and he referred to Shantideva’s advice that faced with a problem it’s necessary to examine whether you can overcome it or not. If you can, you should do what needs to be done—no need to worry. If you decide you can’t overcome it, worrying about it is of no use. Vikram Chandra told His Holiness it had been a privilege to listen to him. S Sathyamoorthy, CEO of the Anti-Corruption Academy, offered some concluding remarks. He noted that His Holiness had advised that our own happiness depends on others being happy and that we should not be deceived by appearances. He told a couple of stories about Yuvraj Krishan, who was his boss, that illustrated the kind of man he was. Krishan had noticed that a particular pensioner was no longer receiving his pension. He discovered that because the man was illiterate officials wanted his thumbprint on the necessary forms. However, he was unable to satisfy them because he had no thumbs. Krishan personally sanctioned the man’s pension. Another time Sathyamoorthy expressed discomfort that in the course of his work as a government official he was accommodated in the grand Taj Hotel in Bombay. Krishan agreed with him and said that on such occasions when he’d stayed there and later saw poor people living on the street he felt like a thief. Sathyamoorthy thanked Krishan’s son and daughter for instituting the memorial lecture, which he said would contribute to fulfilling their father’s wishes. Giriraj Krishan Varma thanked His Holiness, Justice Sikri, NN Vohra, Vikram Chandra and S Sathyamoorthy for their participation, before thanking members of the family for their support.